The fellers over at Gooperative Gaming posted their second video of their Let’s Play session from a few weeks back! This video shows the Harvester as well as the Scorcher which we debuted at Indy Pop Con this past weekend. Check our their video above! If you are a backer and don’t see your name listed among the heroic jumpers on this page please let us know! 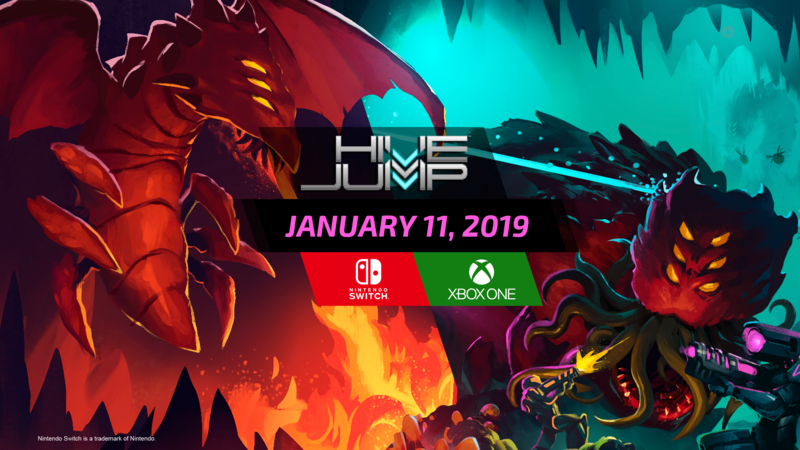 Send an email to info@hivejump.com. Throughout your exploration of each hive, your jump squad may encounter NPCs who have been long lost as they await rescue. Each NPC will offer both information and some sort of perk which will aid you in your mission. The best part, is that many of the NPCs found in Hive Jump were designed by our backers! We’ve loved getting to collaborate with each of you as we craft the story and lore behind your characters as well as the visual style and animations too! We’ve posted three of the NPCs you’ll find in the game and will share more with each upcoming update! Relic rooms appear randomly with in the hives so a smart jump team will take time to search them out. We’ve been revealing new relics with each update and we’ve got two more for you – these were both designed in collaboration with our backers! Rabbit Ears – This oddly shaped relic appears to be antennae for receiving wireless signals. Before the advent of quantum-entanglement based communications, various wavelengths of the electromagnetic spectrum were manipulated in order to transmit data. Inexplicably, exposure to the bio-electric fields within the hive has caused these antennae to cut through atmospheric disturbance and decrease the time for reinforcements to arrive in the hive. Valorous Shield – A makeshift shield reminiscent of those wielded by knights in the days of antiquity. This shield was assembled in great haste by a Tech Officer named Tien from scraps of armor collected from fallen Jumpers after an Ordovician ambush. Tien fought his way out of the hive using nothing but this shield and a handful of scavenged grenades. Tech Officer Tien was awarded a medal for Valorous conduct in delivering data critical to the war effort against all odds. The tools of war may change, but the spirit of valor within human beings remains the same as in the days of the knightly orders of the past.This shield serves as a symbol of valor and protection of human life. More Level Modules, Hazards, and Content! We continue to crank out new level modules and relic rooms to populate the hives with variety and fun! The system allows our lead designer Matt Donatelli (@mattdonatelli) to work quickly and test quickly too! The source is tile based, but we can then see the rendered version too – which looks pretty swanky! These ice caverns are especially treacherous as there are lots of razor sharp crystals that can harm even the most careful of jumpers! Check out some animations from our resident pixel-wizard Ben Severs (follow @bsevers18)! We’re very excited to jump into these hives with you on July 20th! Hive Jump and Indy Pop Con! What can we say about our visit to Indy Pop Con last weekend? It was truly amazing, flattering, and encouraging! Hive Jump EP Matt Raithel (@raitheoshow) and Lead Designer Matt Donatelli (@mattdonatelli) made a road trip to Indianapolis to share the new Lava Environment and Scorcher boss with over 35,000 fans at the con. Little did we know that we would end the weekend with not one, but two rewards for Hive Jump! Oh, yeah, we were also shocked to be brought up on stage and given the grand prize as well! That’s designer Matt Donatelli accepting the Skateboard Trophy and a few clams to help get us over the finish line as well! So from everyone at Graphite Lab, please let us thank you, our amazing backers for your support, and your faith, and for helping us get this far! We couldn’t do it without you!